The word vanilla is a treat to the ears of many as the first thing that comes to mind is the image of an ice cream! The use of vanilla is most common as a flavour of ice cream and most of us associate vanilla with the same or a sweet dish only! This is not correct; there is more to vanilla than merely ice cream. As we are now about to see, there are many different applications of vanilla as well as vanilla extract. These two are often confused as one but they are not. There are some significant differences between the two that we shall now explore. Vanilla is a flavour that comes from orchids of the Vanilla genus. These are primarily Mexican species and are also known as flat-leaved vanilla or V. planifolia. The word vanilla itself is derived from a diminutive of a Spanish word vaina which refers to a pod or a sheath. Three main sources of vanilla are currently grown in the world. All of these are derivatives of a species that was originally found in Mesoamerica as well as regions of today’s Mexico. Talking about spices, vanilla is the second most expensive one (after saffron). This is because growing vanilla seed pods is a labour intensive job. The high prices are also because of the high demand of vanilla which is valued for its unique flavour. On the other hand, vanilla extract is not just a flavour; it is a solution that contains the flavour known as compound vanillin which is the primary ingredient. A vanilla extract that is pure is made by macerating and then percolating beans of vanilla in a solution of water and ethyl (an alcohol). The proportions of the two vary in different parts of the world; for example in the United States, a vanilla extract can be called pure if it contains a minimum of 35% alcohol and 100 grams of vanilla beans per litre (which is approximately 13.35 ounces per gallon). Double strength and triple strength vanilla extracts are also available. When we refer to natural vanilla, the amount of alcohol that is present is very low when compared to a vanilla extract. Only about 2-3% alcohol is there in natural vanilla. Although we may not realize it but the most common form of vanilla that we use today is actually vanilla extract. The main varieties include Mexican, Bourbon, Indonesian and Tahitian. We normally refer to any flavour of vanilla as being natural vanilla although the reality is that most of the times we taste vanilla we are actually consuming vanilla extract. Moreover the composition of the two also varies. Vanilla in its pure form is a combination of vanilla bean extract, water and glycerin. A typical vanilla extract, however, is a combination of vanilla bean extract, water and sufficient quantity of alcohol. The glycerin is not present in vanilla extract. In terms of the flavour, the vanilla extract is a pure flavouring and is a real extract that has been obtained from vanilla beans. Vanilla, in its natural form, however, can vary in flavour depending on the purity of the substance that has been used as well as the mode of preparation. In very simple terms, keeping the composition and the flavour aside, we can also simply say that vanilla refers to the flavour whereas vanilla extract refers to the actual substance that is responsible for the flavour. The latter is also the stronger and the purer form of the two. allana. 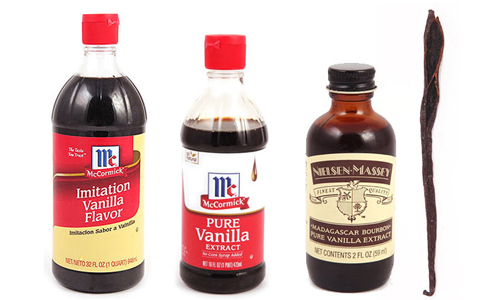 "Difference between vanilla and vanilla extract." DifferenceBetween.net. November 25, 2014 < http://www.differencebetween.net/business/difference-between-vanilla-and-vanilla-extract/ >. Enjoyed reading the article, I had no idea vanilla came from an orchid plant of the Vanilla genus! In the summary section, one part reads, “Vanilla- a flavour that comes from orchids of the Vanilla genu.” Genu is not the singular of genus and hopefully it’s just a typo. Plants generally belong to a genus (binomial nomenclature), while the term genu refers to a knee. Just wanted to let you know, since the rest of the article was very informative!